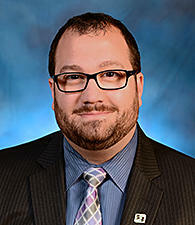 Jacob is a vice president and business banking relationship manager in the Greater Indiana Market. He joined Fifth Third in 2014 and has served Central Indiana for the past 12 years. Jacob has held various leadership roles in Retail and Financial Services. In his current role, he supports businesses with annual revenues between $2MM-$20MM and is responsible for helping businesses grow and remain profitable. He does this through a variety of methods including lending, payroll services, treasury management solutions, and strategic planning. Jacob holds a Bachelor of Arts in Political Science from Indiana University. He is completing a Master of Science in Management and Leadership at Western Governor’s University. Jacob and his wife reside in Fishers, IN with their two children. Jacob is active in his community and currently serves on the Board of Directors of Coburn Place Safe Haven, Mapleton Fall Creek Development Corporation, and Folds of Honor Indiana. He also remains actively involved in student development programs at the Indiana University in Indianapolis.